Once again it is the time of year that the goblins, ghouls, bats, and monsters come out. And of course I am talking about guitars. The only candy I am passing out this year at The Unique Guitar Blog is eye candy from those zany guitars based on bats, monsters, and creepy things. Long before Bob Shade of Hallmark Guitars came up with the Wing-Bat guitar, Walter Höfner of Höfner Guitars came up with Der Fledermaus. This is Der Fledermaus. the guitar, not the operetta by Johan Strauss. It was the most unusual thing to ever come out of the Höfner factory. Der Fledermaus translates to The Bat in English. This was a nice guitar in the Höfner tradition; rectangular controls, just like on their famous violin bass, a zero fret, mother-of-pearl block position markers, toaster style type 1 pickups, and a two-tone sunburst finish. 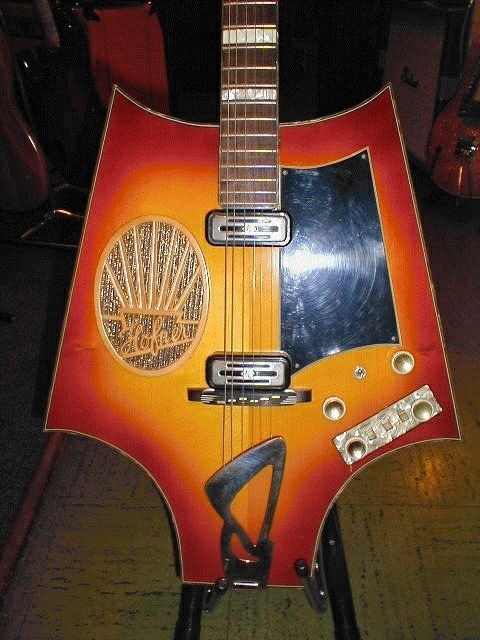 This guitar not only had bat wings, but it also had a built-in 4 watt transistor amplifier. There were only twelve of these guitars ever made. And speaking about Bob Shade and Hallmark guitars, the Wing-Bat Guitar was based on the Hallmark Swept Wing Guitar, but was an enhanced version, which included bat-style wings that were based on the tail section of the George Barris’ Batmobile. 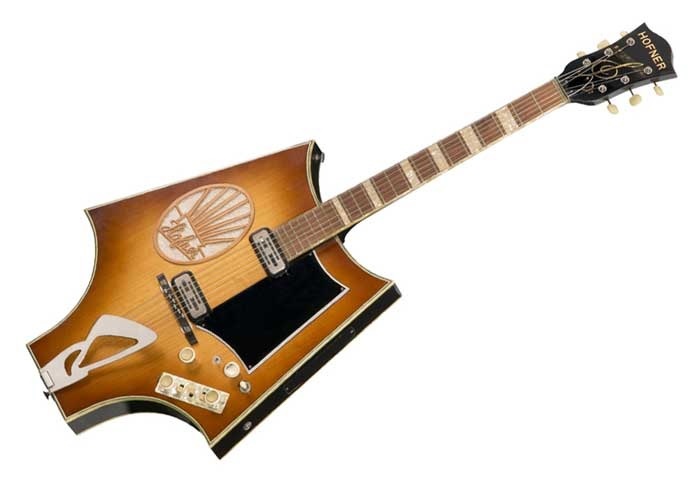 It also comes with an indented tail section, which has a working tail light, a turbine “power boost’ switch, a Mosrite style vibrato and a Hallmark 60 Custom single coil pickup. 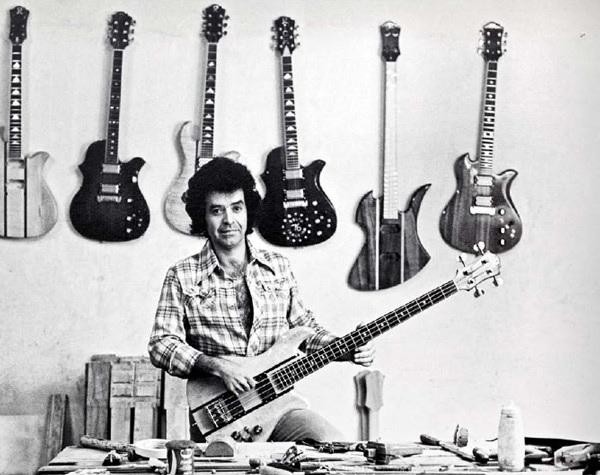 Moving on to other spooky creatures, Jim Burns of Burns Guitars, launched a new company after selling Burns Guitars to the Baldwin Piano Company. He called the new venture Burns of London Guitars and in 1979 he came out with the Burns Scorpion Guitar and Bass. It was probably not his best effort, but I am sure there was a market out there for this sort of thing. Bernardo Chavez Rico owned a wonderful music store in Los Angeles called Bernardo’s Guitar Shop. 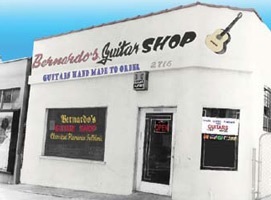 Rico had purchased the building from the Candelas Guitar Shop, which had a rich history unto itself. But that is another story. Bernardo’s son, Bernie, worked alongside his father. Bernie was an accomplished Flamenco player and became involved in luthery work. This shop became a hang-out for musicians in-the-know in the LA area. Around 1968 Bernie began work on a solid body guitar. This started a venture that we know as B.C. Rich guitars, which became world famous. One of their best sellers with the Heavy Metal set was The Warlock, which was welded by such players as Mick Mars, Lita Ford, C.C.Devile, and Paul Stanley of KISS. 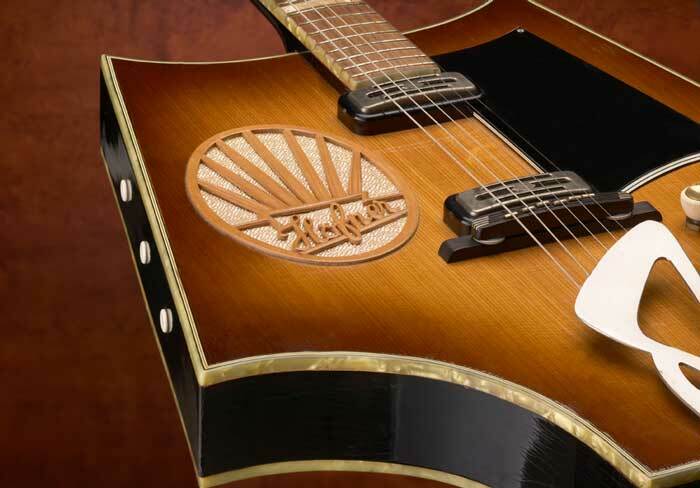 For the past decade, Epiphone, as owned by Gibson Guitars, has never been shy about jumping on a fad. 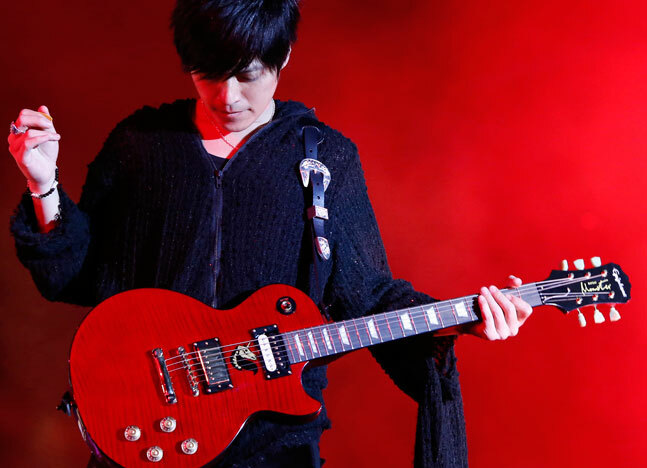 Guitarist Wen Shang-Yi of the Taiwanese band MayDay is endorsing their lasted creation, The MayDay Monster Epiphone Guitar. This was introduced last August and is actually a very nice instrument. It has a 1960 rounded D profile neck, a glued-in neck, a rosewood fretboard with trapezoidal inlays, and twin USA manufactured Gibson Burstbucker pickups. MayDay is a very popular band throughout China. Though he is really not a monster, he certainly has monster chops and has a nice costume. Buckethead has been playing his own style of guitar for a longtime, For a while he even wrote a column for Guitar Player magazine. 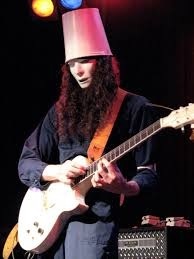 Gibson Guitars unveiled its Buckethead model several years ago. 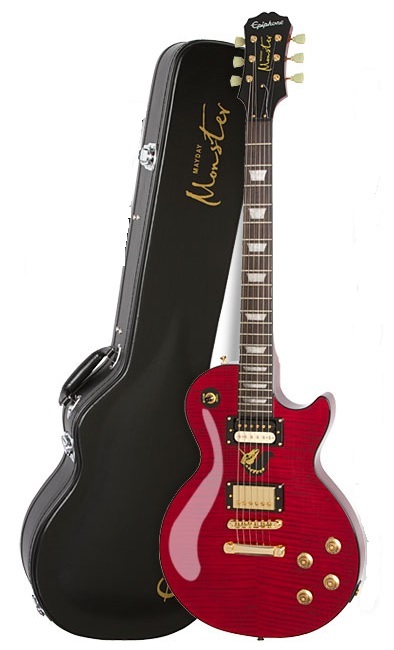 This Les Paul style guitar comes with an Alpine White finish on its two piece maple top and features a pair of Gibson contemporary-voiced Ceramic series humbucking pickups that are very hot. And it features two kill switches. It is indeed a gorgeous instrument. 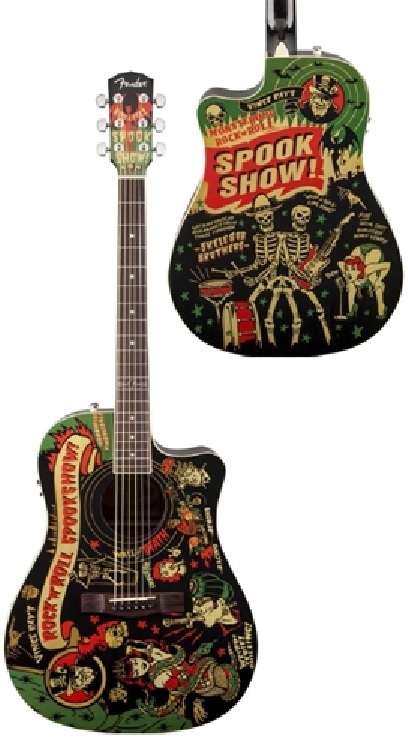 A few years ago Fender came out with the Fender Vince Ray “SpookShow” T-Bucket acoustic guitar, which featured the illustrations of pop-artist Vince Ray on its top. 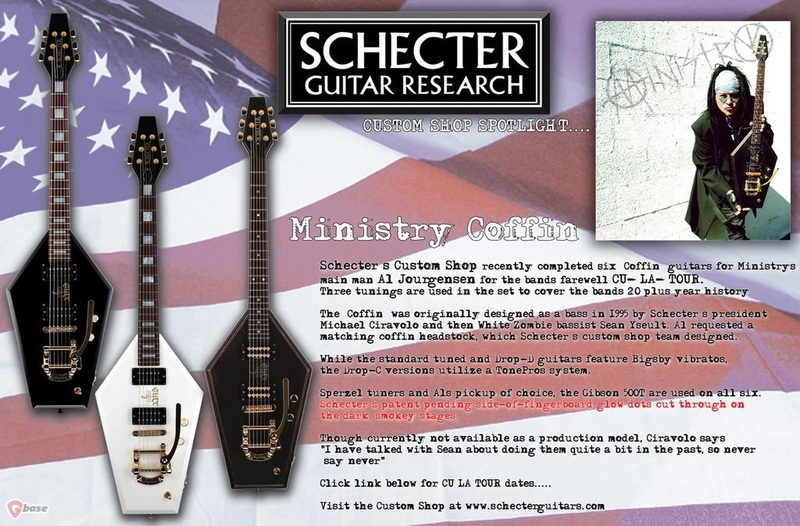 Schecter Guitar Research once built this Ministry Coffin guitar for Al Jourgensen of the band, Ministry. Kirk Hammet of Metallica is fond of his ESP Mummy Guitar that is graced by the image of Boris Karloff on its top. As always, click on the links under the pictures for the source. And click on the links in the text for further information. Hey thanks Glenn. Yeah, I remember that one. I wish I would have thought of it.